Liquefied natural gas (LNG) vaporizers to re-gasify liquid natural gas for import terminals worldwide. 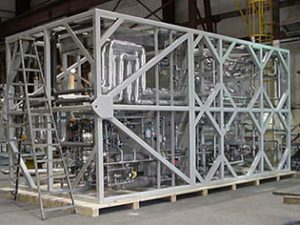 Custom formed ASME certified stainless steel tube bundles, all welded into a header manifold system and packaged into a common housing with separately mounted but integral, skid mounted external process gas circuits, controls and instrumentation. Pressure/Temperature Swing Adsorption system generally part of a larger cryogenic air separation plant. 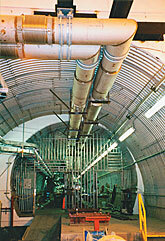 Installed upstream of the cryogenic distillation column, the adsorption cycle is part of the overall process used for removal of impurities from the inlet air stream and typically feature large bore carbon steel piping up to 30" diameter all mounted onto common structural steel bases with shop fabricated interconnecting spools for field routing between each free standing vessel containing the proprietary adsorption bed materials. High temperature (500°C design) skidded combination H20/N20 purifier and adsorption system consisting of ASME certified vessels constructed of type INCOLOY 825 materials including all process lines and control valves. 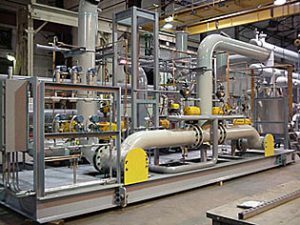 Full scope included installation of all instrument tubing, electrical interconnect wiring to a common control panel along with high temperature ceramic insulation. 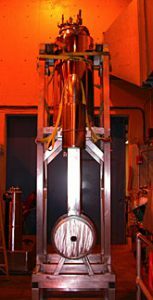 CVIP, along with the collaborative design efforts of MIT, LLNL and LBNL, shop assembled the HCX (High Current Experiment) cryostat for the heavy ion fusion program (HIF) consisting of two superconducting quadrupole cells contained within a shop fabricated 4K inner cold mass container, LN2 thermal shielding and a low-emissivity radiation shield, all were packaged within the lower portion of the cryostat housing. This lower, packaged quadrupole cell assembly was then connected to the separate and upper portion of the overall cryostat assembly called the VCL (Vapor Cool Lead). 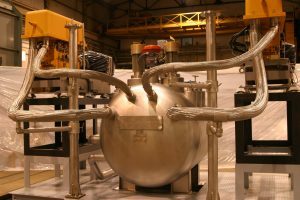 This upper assembly was the liquid helium vessel or reservoir for supplying and maintaining cryogen cooling within the lower cells. 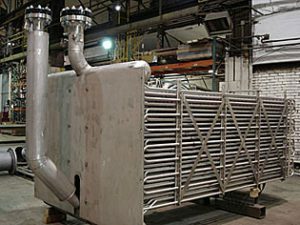 Cryogenic refrigeration system for an in-grid 350 meter long, high temperature superconducting cable demonstration project partially funded by the Department of Energy. System included a thermosyphon ASME certified vessel, two liquid pumps and various valves and controls all packaged and contained within a very compact, skid mounted, super insulated vacuum jacketed cold box along with a separate combination vacuum jacketed filter/flow metering skid. CVIP also provided on-site field installation. CVIP shop fabricated and vacuum leak tested complete spool sections plus provided on-site field welding assistance covering the complete vacuum jacketed piping distribution system used for supplying cryogenic cooling to a total of 1,740 superconducting magnets connected end-to-end within a 2.4 mile continuous underground tunnel network, all at liquid helium temperatures. 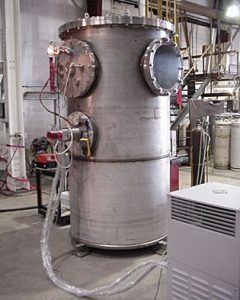 A single, common 20" diameter outer vacuum jacket was constructed with a liquid nitrogen cooled inner aluminum shield surrounding four separate inner carrier lines all used for moving gaseous and liquid helium from each helium source to each magnet use point. Click here to learn more.